With the help of Lore, a former goth girl who knows a thing or two about the dark side, Max is racing against the clock to get rid of the houseguest from hell before time, and all the Flamin’ Hot Cheetos this side of the fiery abyss, run out. A little awkward since my last book review was Beautiful Outlaw about the joy that comes with really knowing Jesus Christ, but so it goes. I have varied reading tastes. And Gina Damico gets me every time. Seriously, this woman and her stories. Max is a good kid. He's got a rough life, caring for his dying mother, working to make ends meet, but he's a good kid. Until he steals a small porcelain cat from his work at a convenience store. His mother collects knick knacks, and he's sure this particular cat will put a smile on her face. This small, minor, moral slip starts a landslide that ends with a devil in his basement demanding a home of its own. Damico excels at dialogue and to my great pleasure, tossing in pop culture references. This little gem of a story included several glances at You've Got Mail (my need-a-smile movie) and Lloyd Dobler (Mr. Boombox himself). The characters are likable yet flawed. Max is a good kid, but he's a perfect example of the slippery slope that is poor decision making. And Burg, despite being a devil, shows a bit of a compassionate side. Often right and wrong are situated in a very shady gray. This is a light, funny book that sneaks in an interesting conversation about responsibility and consequences. Sometimes when we get what we want, the wrong people get hurt in the process, even if we have the best of intentions. 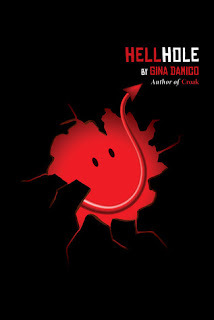 Despite the title, Hellhole is a relatively clean read. While I thought it got a little long in some points, each scene showed poor Max's spiral out of control. I wanted so badly to reach into the book, grab his shoulders, and shake him until he listened. But he's a teenager. Not sure that would have worked anyway. Can't wait for Damico's next book coming out later this year. While you're waiting, consider Hellhole, and prepare to have your funny bone tickled.